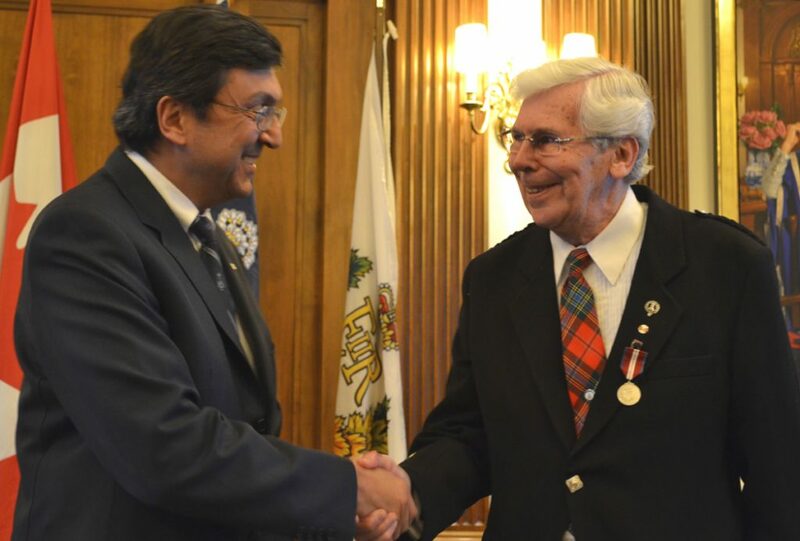 Congratulations to Professor Emeritus Alexander McLean, who received a Queen Elizabeth II Diamond Jubilee Medal at a private ceremony hosted by U of T president David Naylor on February 14, 2013. The Medal, established to commemorate the 60th anniversary of Her Majesty’s accession to the throne, recognizes Canadians who have made distinguished contributions to Canada. 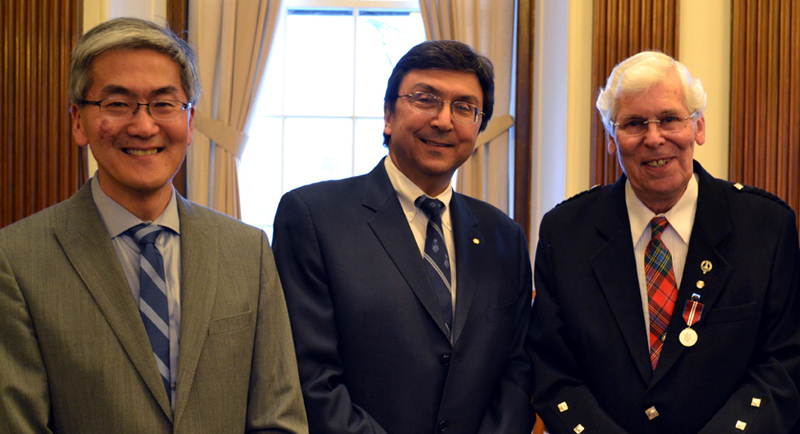 Of the 2,070 Fellows of the Royal Society of Canada (FRSCs), 30 in total will receive the Jubilee Medal. Professor McLean is one of five recipients from the U of T Faculty of Applied Science & Engineering to receive this honour. Professor McLean is recognized worldwide as Canada’s most distinguished scientist in the field of physical chemistry of steelmaking. His philosophy has been to develop fundamental understanding of scientific phenomena and facilitate implementation of the acquired knowledge within production systems. Professor McLean’s pioneering work on reoxidation reactions involving thermodynamics, kinetics and fluid flow studies has revolutionized industrial practice for the continuous casting of steel and led to levels of quality which would not have been otherwise attainable. Additional contributions have included the chemistry of oxide melts; plasma processing; sensor development and the net-shape casting of novel materials. He has authored over 200 technical papers and six books. The numerous honours and awards which he has received from academic institutions and professional societies within Europe, Japan and North America — such as Fellow of the Royal Society of Canada (FRSC) and the RSC’s Thomas W. Eadie Medal — are clear evidence of the high regard in which Professor McLean is held by the international metallurgical community. Professor McLean also served as Chair of the Department of Metallurgy & Materials Science (now ‘Materials Science & Engineering’) from 1992 to 1997. During this time, he commissioned and led a Departmental Strategic Planning Committee that transformed the undergraduate curriculum to reflect broader fundamental learning areas and applied knowledge in materials engineering. Professor McLean was accompanied by his spouse, a number of family members, as well as close colleagues and friends at the ceremony.